I live in a beautiful seaside place where we get to see killer whales go past from time to time. 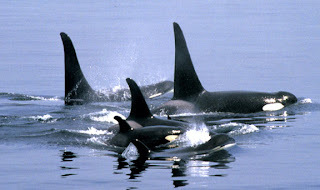 Orcas are magnificent animals, and over the years, we've had some very moving experiences with them. This morning, the rocks by the beach were covered with human animals, waiting to catch a glimpse of these powerful black and white creatures. As we watched the orcas spyhop and blow and slap their fins, I heard someone say, "It's like the paparazzi here, with all the cameras clicking." And that's when it struck me. In our culture, we tend to "do" Nature, like voyeurs or like athletes, rather than experiencing the rest of Nature as parties to it, as a part of it. It reminded me of a teenaged tourist about to go off on an Africa safari in Kruger Park, South Africa. "Dad," she complained to her father, "if you've seen one giraffe, you've seen them all." Actually, no. Spend any time with giraffes — or any other creature on Earth — and you will soon see all the differences between individuals within species and between species that seem quite similar. You'll also discover all the similarities that unite us as living beings on one planet. But we have to take that time. Part of safeguarding the future is going to entail a slowing down, a rebonding, a relearning of the ancient connection between all living things. And the longer we just sit, observing our neighbours of other species, or falling asleep in the sun, or chewing on some grass, the less we're driving about spewing greenhouse gas emissions! My husband and I have been greeted — eye to eye — by whales, have sung to whales, have watched whales push a sick pod member to the surface, have witnessed a baby whale nursing. We would have missed the privilege of all these fantastic shared moments had we not just slowed down a bit and gotten past the notion that Nature is a "show."